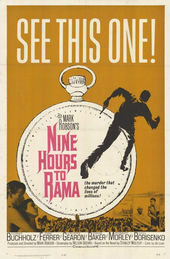 Author Pat Kirkham discusses the opening titles for Nine Hours to Rama, from her authoritative book Saul Bass: A Life in Film and Design. The ability to magically heighten realism and transform the ordinary into the extraordinary is evident in the titles for this film about the nine hours leading up to the assassination of Mahatma Gandhi. The ticking of an old-fashioned pocket watch symbolizes the final hours, minutes and seconds of this great man's life. “The entire title consisted of a series of close-up images of a clock face and its interior. By concentrating on these images, two things happen... we establish the intensity of the passage of each moment of time, but also the contradictory nature of time, the inexorability of the passage of each moment — especially if one knows that a momentous killing will soon occur — and yet so elastic that a single moment can feel like an eternity.